As Memorial Day beckons, we will be enjoying barbecue and other tasty treats. Summer is here. It is the perfect time to take a load off and enjoy everything that summer has to offer. A word of caution though is in order. 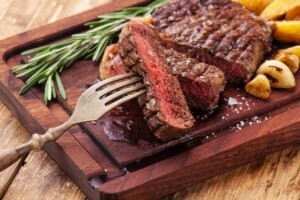 For those of us with migraines, it is tempting to want to reach for that piece of watermelon or juicy steak during Memorial Day weekend. However, we need to stay vigilant. Just because we are relaxing does not mean that we can forget the disciplined approach of keeping to the diet that helps the migraine stay away. Don’t get me wrong, I enjoy this time as much as the next person but I’d rather not have a migraine. Discipline means that you don’t forget to track everything you are consuming. When Uncle Harry is finishing up that 10 oz. steak on Memorial Day weekend, don’t forget to ask what the ingredients for his dry-rub are. Stay away from BBQ sauces where you are not 100% sure about the ingredients. Spoiler alert! Most BBQ sauces are not safe for migraine sufferers. Whether it be onion powder, garlic powder, paprika, cayenne pepper, “spices”, or “natural spices”, often times these are likely to trigger episodes. Instead, ask to have the steak done clean, meaning nothing but salt and possibly black pepper. If you absolutely have to try the BBQ sauce, ask for it on the side and ONLY if it does not contain ingredients that may cause migraines. 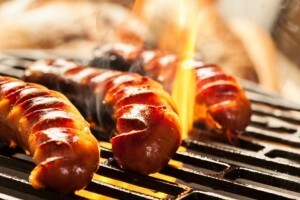 Grilling sausages on barbecue grill. For the uninitiated, beautifully grilled sausages with mustard and ketchup might be just what you feel you need. Keep in mind that when it comes to sausages, whether it is nitrites or nitrates, fennel seeds, chili peppers, cayenne pepper, or other ingredients, these do not play well with migraine sufferers. Unless the person who is grilling is a migraine sufferer, chances are good that the sausage will not be appropriate and should be avoided at all cost. I know what you’re thinking – One sausage is not going to make a difference, right? On the contrary, one is all you need since it is not about quantity but rather about specific trigger ingredients. Normally, mustard already contains trigger agents and adding this on top of the sausage constitutes a double whammy. Then again, how tasty is sausage without mustard? Remember, that I told you so when that massive migraine starts. 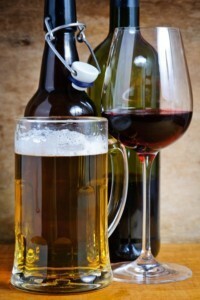 For most migraine sufferers, alcohol is difficult to consume. During the Memorial Day weekend and during summer, beer and wine will be on offer everywhere. Politely decline both of these in favor of drinks that are safe. How about a cold sweet ice tea? I know that you will seem like a square but then again, a square without a migraine sounds pretty good to me! What about white wine? Isn’t just red wine the problem? Unfortunately, most outdoor events will serve the cheap stuff with plenty of sulfites, even if it is white. It is just better to stay away and enjoy not having migraines, while taking in something else. As the temperature increases, you might find yourself reaching for that juicy piece of gorgeously painted dark red watermelon. Don’t! Instead, remember that watermelon can be incredibly problematic for those of us with migraines, and while you will most certainly enjoy it, pain could likely ensue. 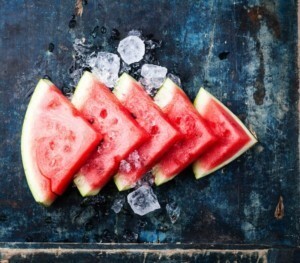 Even in the case that it is super fresh with light pink coloring and crunchy texture, watermelon should generally be avoided since you didn’t buy it and don’t want to risk it. What would summer be without ice cream, right? Well, now you are really going to get agitated while thinking “hands-off my ice cream”. It’s not that ice cream is always bad for those of us with migraines but again, what are the ingredients in the ice cream? Remember that ice cream generally has “cream” in it; shocker, right? In many cases, all dairy needs to be avoided. If dairy is not an issue, make sure that the ice cream does not contain something you cannot have. 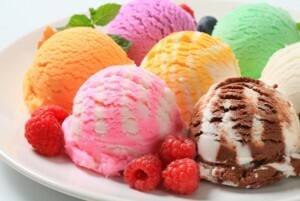 Examples of some ice cream ingredients that may need to be avoided in addition to dairy include lemon, pistachios, coconut, chocolate, yes – watermelon, caramel, etc. Again, if you don’t know whether one or more of the ingredients could be triggers, don’t eat it. Don’t assume that it is safe. On the other hand, if you want to give it a go, just be prepared for that migraine. Here’s hoping that I have not totally ruined your weekend and summer.